How does Zoho Flow work? 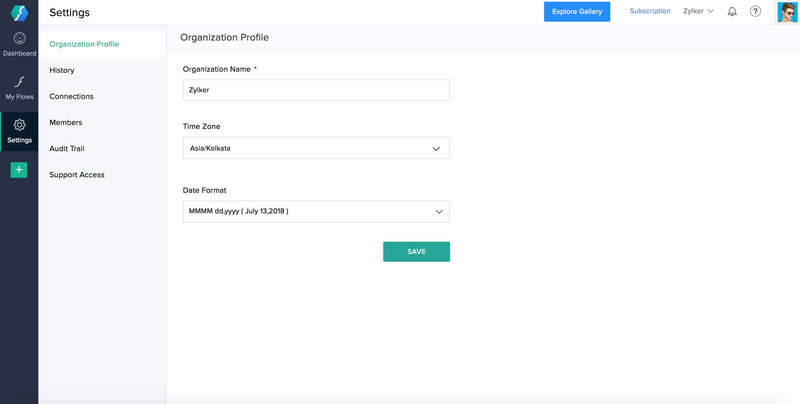 Zoho Flow is an integration platform which connects cloud applications. It helps you set up workflows to automate information exchange among the apps you use. With Zoho Flow, you no longer need to learn code to integrate. A flow is the combination of a trigger and action(s). The trigger kickstarts the flow, and the actions are tasks executed by the flow. The trigger can be a data update or a scheduled point in time. For example, you can create a flow that creates or updates contact in Zoho CRM whenever a new entry is submitted in Zoho Forms. 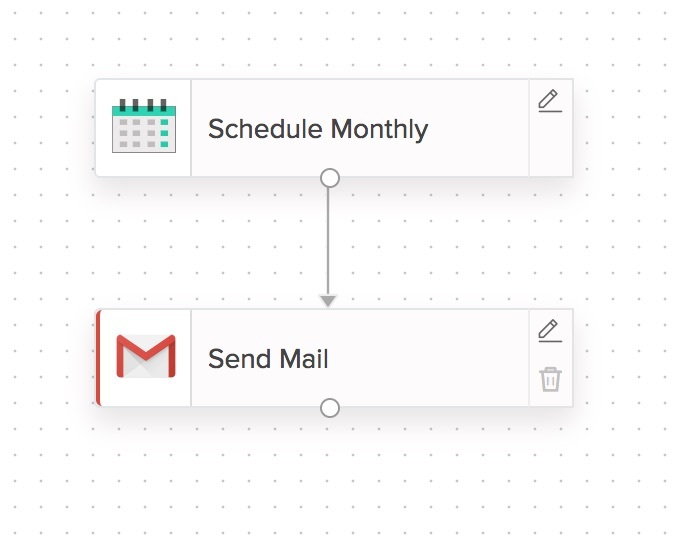 Or, you can create a flow that sends a monthly email reminder to your employees to submit their reports. The action can be updating data in an app, sending an email, delaying for a specified period, or a custom function. You can also include branching logic based on different conditions to create powerful flows. For example, you have a flow that sends an email 15 minutes after an entry is submitted in a form. This flow has two actions: delaying for 15 minutes and sending an email. 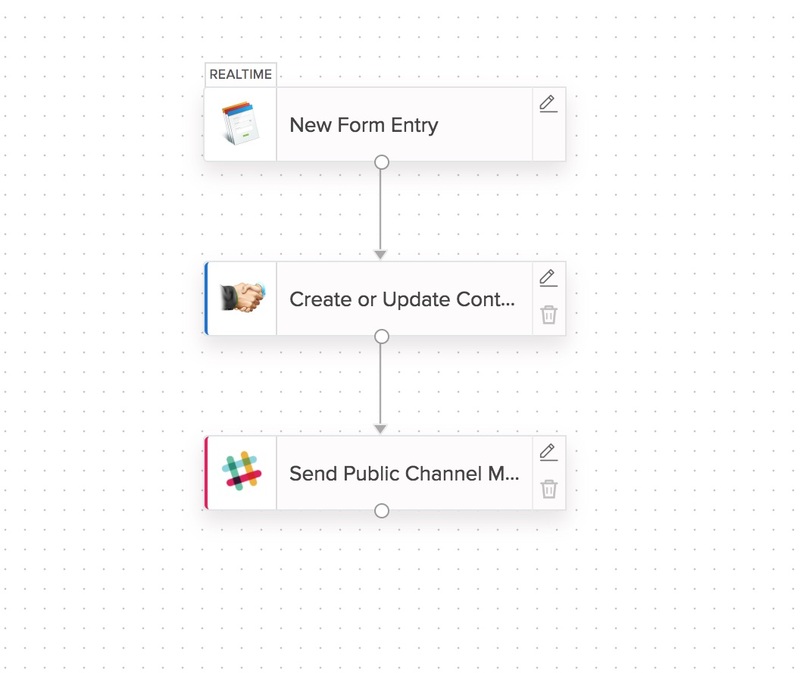 Zoho Flow provides a platform for you to create flows that connect cloud apps to automate data and information transfer. This lets you save time so you can focus on tasks that require more attention. Your apps will share data automatically, so you'll have what you need at the right time and place. For example, you want to create or update a contact in Zoho CRM every time a new entry is submitted in Zoho Forms. In this example, receiving the new entry is the trigger and creating or updating a contact is an action. You can add multiple actions to a flow to execute sequentially. In the example above, you can add an action to send a message to a specific Slack channel with details of the contact from CRM. Logic elements automate complex business tasks, down to the smallest details. 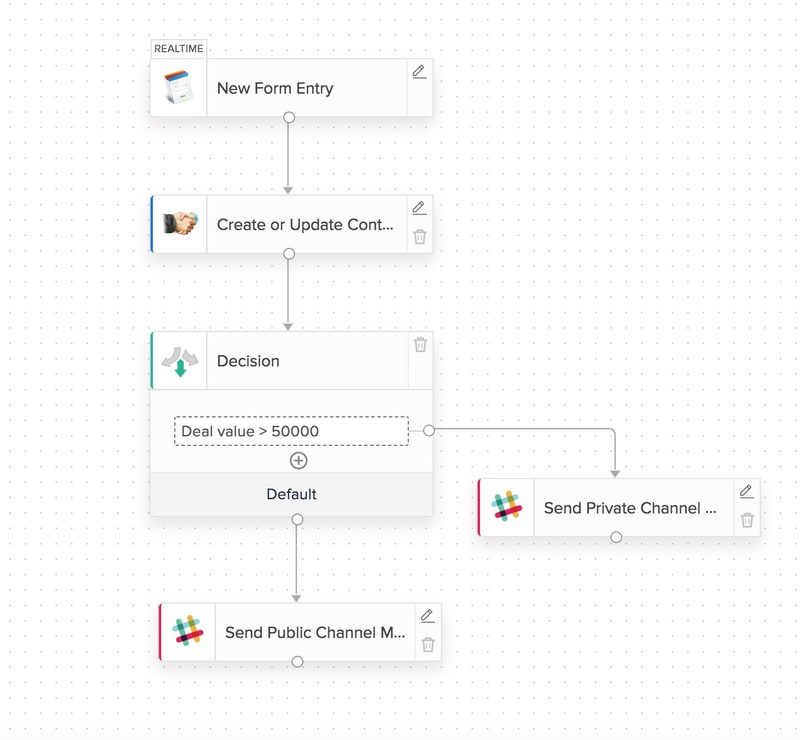 In the above example, you can configure decision logic to choose which Slack channel the workflow should send message to, based on the value of the deal. A workflow you can create to connect various cloud apps. A flow contains a trigger and one or more actions. For example, when a new form entry is submitted in Zoho Forms, the flow can check the customer details in Zoho CRM and add or update a contact. Either a data update in another app or a scheduled time to kickstart the flow. This triggers the workflow to execute the action(s). For example, when a new entry is received in Zoho Forms, a contact is created in your CRM. Receiving the form entry is the triggering event for this flow. You could also use a schedule trigger like sending the list of tasks as an email every day at 10 am. A task that the workflow executes. Steps involved in processing tasks such as a delay, sending an email, and custom functions are also actions. For example, when a form entry is received in Zoho Forms, the actions are creating or updating a contact in your CRM, and sending a Slack message to a channel based on the deal value. 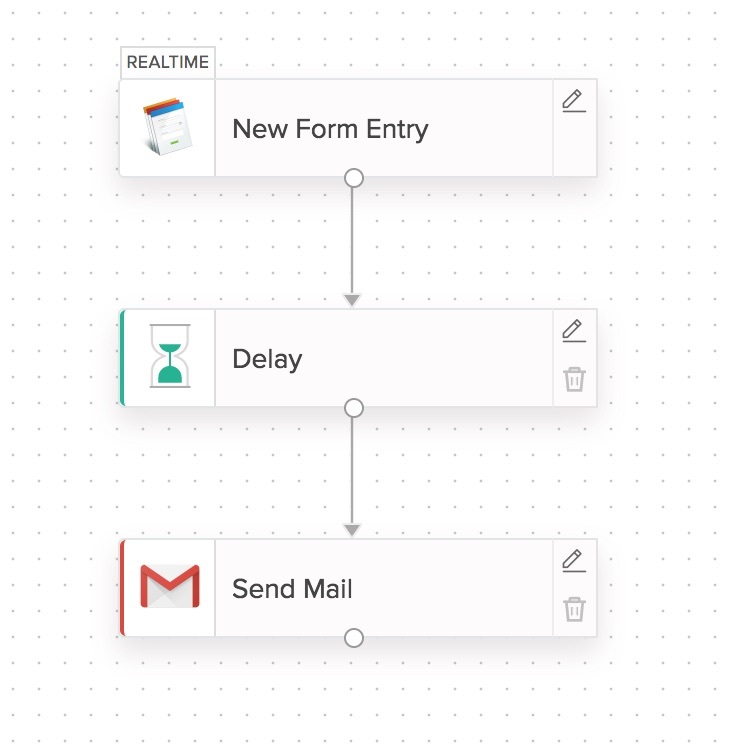 If you have a flow that sends an email 15 minutes after an entry is submitted in a form, the flow has two actions: delaying for 15 minutes and sending an email. A connection is an app account that Zoho Flow has permission to exchange data with. For example, you can connect your Trello account or your team's Gmail account to Zoho Flow. Click on a flow to edit it or view execution details. Each flow consists of three tabs: Summary, History, and Builder. 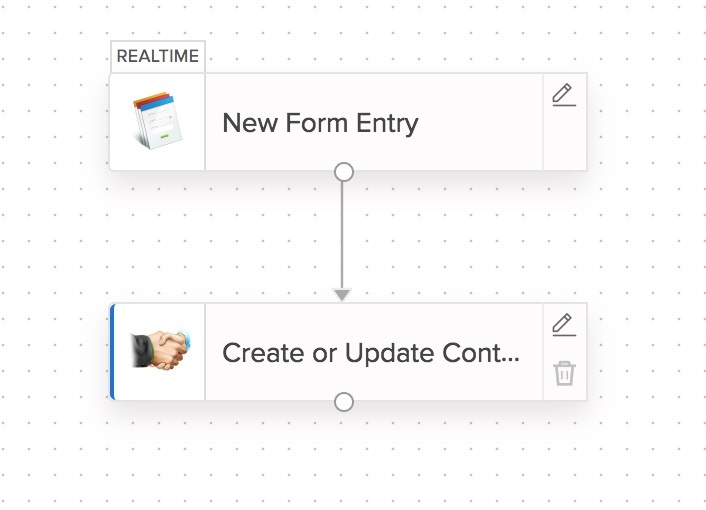 Build, configure, and edit your flow in the builder. Builder tools will help you create a workflow. Use app actions combined with logic elements to add details and custom rules to your workflow. View all details related to the flow such as success rate, recent executions, and connected applications. You can also edit the name and description of the flow. Every execution of the flow is recorded in the History tab. You can view the history for a particular time frame by applying a filter. Click on each execution for more details such as the input and output of each task. This is especially useful when an execution fails and you need to check where the error occurred to troubleshoot.